T&T Powersports head mechanic and shop foreman, Steven Radel, explains the most common mistakes he sees when customers are purchasing a dirt bike: No. 1 would be purchasing a bike that will be quickly outgrown, both in size and horsepower. Next would be people without any mechanical knowledge buying a high-maintenance machine. For some people, it can be daunting when first buying a bike so they opt for a smaller, less powerful machine, which is a great learner, but they find that after a few months, they want to trade up. This can be expensive if you are buying new and need to trade once or even twice to get the bike you want as your needs and skills develop. The same can be said about customers who want the biggest and baddest bike on the market and don’t really consider what is involved in maintaining and keeping these dedicated race bikes in good working order. It is inevitable that, at some point, you will take out an engine with a race bike. It is inevitable and expensive. Unless you plan to race or ride the track on a regular basis, then this type of bike may not be your best option. How much do you realistically have to spend on a bike? Will you be financing it or paying cash? If you’re financing it, it may be necessary to go with a newer bike, as some companies will not finance a later model bike. On the flip side, you can usually gain a lower interest rate when purchasing newer, with more flexible terms. Stick within your budget, for the more money left in your pocket at the end of the day, the more money you will have to play with. Track, trail or dual sport? What type of riding will you be doing? It is counterproductive to purchase a motocross race bike if you are going to be riding mostly single track and trails. The gear ratio is different for each purpose, so a race bike will not perform as needed if you are wanting to enjoy the most out of single-track riding. The frustration will build after each stall, leaving you wanting to throw your brand new bike off a cliff. Track bikes are geared the lowest because on a track you rarely use your top two gears, so top speed is not a consideration. The lower gearing on a track bike gives you better acceleration, allowing you to build speed quickly and enabling you to power out of the corners or clear that big double jump. The gearing on trail and dual sport bikes is very similar. Sometimes, trail riders will gear a little lower for better throttle control and less riding of the clutch over obstacles but they still want a good top speed for hammering down a cutline or gravel road. Dual sport bikes are geared for all-around riding, including being able to maintain a good speed while cruising down the highway. Advanced riders will always adjust their final drive gearing to suit the type of terrain or riding that they will be doing. The features of these three types of bike vary. A track bike is a bare-bones bike with no instrumentation or warning lights. The trail bikes usually have a basic gauge or instrument panel and usually include such features as a coolant temp light, oil light and possibly a speedometer. Dual sports will have full instrumentation with speedo, warning lights, am trip meter, odometer and some come with a fuel gauge. If you do not have a truck or trailer and live a fair distance from your trails, perhaps look into a dual sport type bike, as you can zip to your play area with ease. Street legal, but capable of off-road activities, these bikes are getting more and more popular. This popularity is partially due to the soaring price of fuel, as these bikes are great on fuel and they are fun in the woods. Be wary of bikes that have been converted to street use, as these may not be 100 per cent legal. It is a grey area, even for grandfathered-in bikes, as the Department of Transportation can and will pull them off the road without warning. It’s best to spend the extra dollars on a bike you know is street legal. The two-stroke bikes were starting to be replaced by the ever dependable four-stroke models, but recently they’ve been making a comeback. 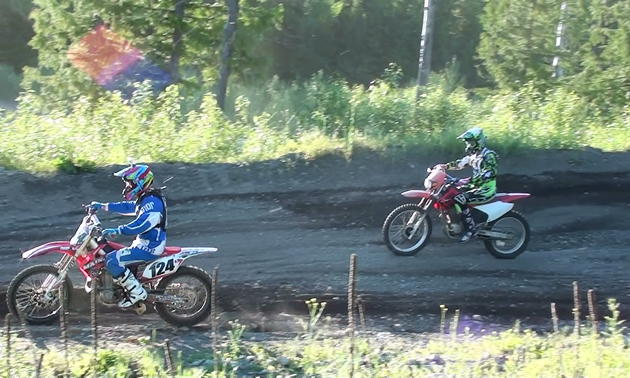 There is nothing like the snap and pop of a two-stroke, but they can be louder and smellier. There is a lot less maintenance with an air-cooled two-stroke bike and they are cheaper to rebuild. The initial cost is less with a two-stroke and they are a lighter, more agile bike. The power band of a two-stroke is different; it can be addicting as you hit the sweet spot and feel the immense power pulling you forward. Four-stroke models are very torquey on the bottom end with a more predictable type of power. They are great for beginners and leisure riders. The engines have a longer life span, although they do require more maintenance, such as valve adjustments and frequent oil changes. A liquid-cooled four-stroke can become your biggest nightmare if you attempt a top-end rebuild. How mechanically inclined am I? This is a huge factor when it comes to bikes. This could determine the difference between saving up for a newer bike or jumping into a project bike. No matter how you look at it, powersports activities are not cheap. If you are not mechanical, or confident in your repair skills, it may be wise to have patience and buy a bike that is newer. There are many off-shore models out there that are cheap to purchase, but understand that they are cheap for a reason. You absolutely get what you pay for when you purchase a bike. The off-shore bikes tend to require a lot of upkeep, repairs, Loctite and patience as parts can and will fly off unexpectedly—I know this from personal experience. They will work for a short while, but if you are in it for the long haul, invest in a bike from one of the major manufacturers, such as Yamaha, Suzuki, Honda, KTM, Kawasaki or Husqvarna. Buying a dependable brand name will ensure you’ll always have the parts needed and the service know-how to keep your bike running at optimum potential. This question requires you to check your ego at the door. Honestly, what is your skill level? Do you seriously need a 450R type of bike if you’re brand spanking new to biking? Not only is this potentially dangerous, but it will, in fact, limit your ability to learn how to ride if your bike exceeds your comfort level. Your confidence will become shattered as your brand new bike rides you instead of you riding it. There is nothing wrong with wanting E-start. I had a situation arise that made me forever fall in love with electric start. My husband and I were biking along on a beautiful mountain trail and he was ahead of me. Quite new to biking, I was putting along when I realized the black blob coming towards me was a bear—a bear that my husband had scared and was running straight for me. I ended up in a death wobble, stalled and tipped over. At that point, I’m quite certain I wouldn’t have had the co-ordination or the state of mind to kickstart a bike. Electric start, I dig it! How much time will you spend biking? Will this be something you’ll enjoy doing as a family, or will it be a bike you’ll ride on occasion? If you are planning on spending a lot of time on your bike, save for what will be best suited for you, rather than settling. On the flip side, you may not need the fanciest of beasts if you plan on riding only occasionally as the season permits. We find that the most exciting times of our marriage are spent brapping together, so it only makes sense that we both have the bikes we will enjoy. My husband has a Husqvarna 450 with an automatic-type clutch and I have a Honda CRF 230F that I call my wonderful tractor. Each of us finds that these bikes are exactly what we want. I love being able to literally tractor through all of the tough single-track we enjoy, while he enjoys the sheer horsepower of his 450. The 230 has just enough oomph to enjoy, but is versatile enough for our teens to ride and enjoy. Now that the kids are older, they are saving for their own bikes. Leo, my son, is looking into a 250X-type of setup, which gives him trail enjoyment and a headlight in the event that he doesn’t make it home before dark. Which dealers are close by? This can be a big factor when choosing your bike, as you will require parts, service and technical assistance at some point. Having to ship parts can get spendy—even if you are choosing to bargain shop on eBay. Sure, eBay can save you money, but you cannot always be sure that what you are getting is a part or accessory of quality. Being able to shop in person is worth its weight in gold. Your service technicians have years of experience and when treated right—a six-pack or a box of doughnuts can go a long way—will become a wonderful source of information and troubleshooting when it comes to getting to know your new bike. Never take your service people for granted. They simply have the training and the expertise to make your bike work, even when you are at your wit's end. Sometimes paying for the couple of hours of shop time is what it takes to get even the most simple job done right. Valve adjustments are a prime example. How tall are you? How much do you weigh? How strong are you? These are all questions to ask yourself before purchasing a new bike. The arm-stretching power of a two-stroke 250 may be too much oomph for you if you’re just a wee thing. On the other hand, if you tend to be on the heavier side, perhaps look into a bike with a beefier suspension and enough ponies to carry you comfortably around. The seat height of a bike can be adjusted on most bikes by manipulating linkage and shock pressure. Ask your salesperson about this if you find a bike that’s just a little too tall for you. If you are buying a bike for an ever-growing child, this is another factor to consider. Most youth-sized bikes tend to hold their value quite well if they are well maintained. Buy the bike that is best suited for your child’s height, strength and skill, and allow them to grow into the sport of biking safely and effectively. Your happiness and safety depend upon your willingness to be honest with yourself. Use the above guidelines to narrow down your search and don’t be afraid to ask questions from experienced riders in your area. If possible, try out a few bikes to give you a feel for what the different bikes have to offer. Many dealerships will provide demo opportunities to help you out. Be thrifty, but not cheap, and above all else, think about the bigger picture. Money can’t buy you happiness, but it can buy you a dirt bike—and that’s pretty darn close. 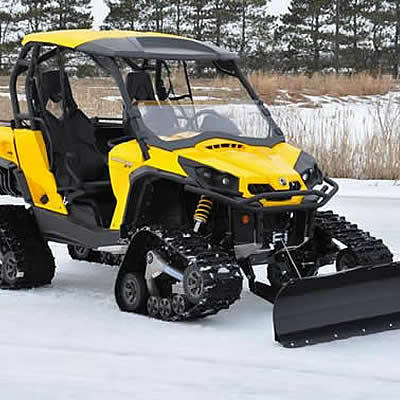 Here are some ways to customize your ATV and UTV for use in the wintertime. 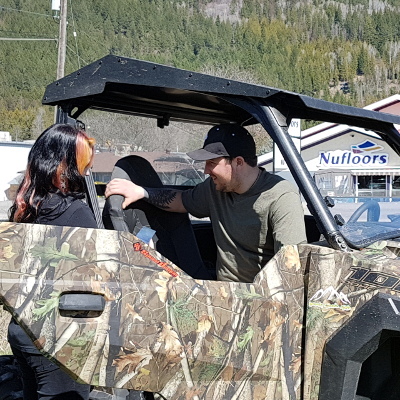 Trish Drinkle highlights four of her favourite products for cleaning and maintaining ATVs, motorcycles and snowmobiles.